Ken’s life was colorful and eventful - 83 years well lived and with a prodigious output of music, radio and writing. This was an extraordinary opportunity to present someone’s life and work in an original and modern way. However, with virtually no visual footage remaining and the BBC’s sound recordings lost or destroyed, Ken’s personal archive was the only significant source remaining of his life and work. But it was a treasure trove of material waiting to be mined and shared. Ken had many passions: music, radio, words, food and in particular, the music of Django Reinhardt. These elements formed the basis of the cross-media project. The Man with the Jazz Guitar is a feature documentary presenting his life story; a limited edition double CD of his music; an online radio station dedicated to his work; an online archive sharing some of his varied passions, a multimedia website and much more. Using Ken's archive as the primary source material, the feature documentary became a 110 minute inventive musical biography using a mix of animation, sound clips from his radio programmes, memorabilia, interviews and location photography - all set to an evocative soundtrack with Django Reinhardt, Stéphane Grappelli and rare recordings of Ken not heard for more than 50 years. 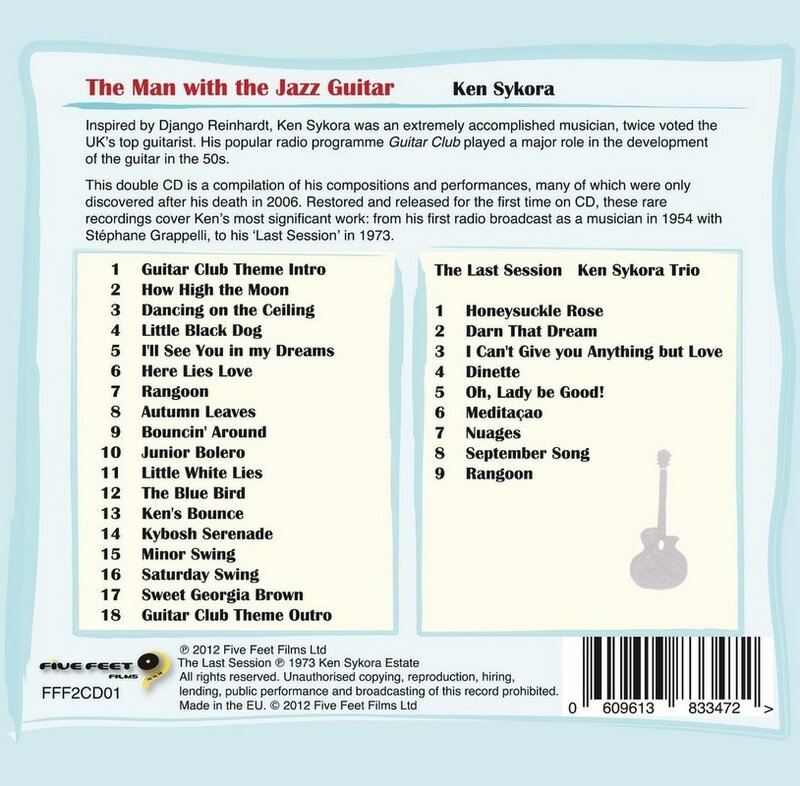 Inspired by Django Reinhardt, Ken Sykora was a self-taught guitarist who played as a session musician and fronted his own bands. Voted the UK's top guitarist twice, Ken left an unforgettable imprint on the people who heard him at the time. were pieced together from the few vinyl records on which he featured, plus reels found in his archive: recordings of his live radio performances, rehearsals and studio sessions with his bands. The recordings were digitised, cleaned, re-mastered and released, many for the first time, on a Limited Edition Double CD. A 16 page booklet insert was produced, featuring Ken's biography, photographs and the stories behind the tracks. Through the 27 featured tracks, including 9 of his own compositions, the album presents Ken's most significant work: from his first radio broadcast as a musician in 1954 with Stéphane Grappelli, to his 'Last Session' as the Ken Sykora Trio in 1973. The Ken Sykora Radio Station is a tribute to Ken as a broadcaster and a musician. He recorded more than 3,000 radio programmes during his 40 year radio career. His eclectic broadcasts ranged from presenting live jazz, interviews, to series based around music, food, and fascinating facts – always masterfully created. Ken kept recordings of many of his programmes. Some were uploaded in their entirety, while a range of weekly themed ‘specials’, were compiled from the archive source material. Two complete editions of “Guitar Club”, Ken’s seminal BBC radio show from the 50s, dedicated to all guitar styles, were made available, along with his very first programme: a Django Reinhardt tribute from 1956. A one-off “Guitar Club 2012” was produced, using a social media campaign to invite current guitarists to record and submit tracks. The Ken Sykora Radio Station provides a legacy for Ken as a broadcaster that would otherwise have been lost. Ken Sykora was a compulsive collector: from his teens in the 1930s, buying Django Reinhardt 78s, and on throughout his life until 70 years later he had amassed a collection of some 7,000 records, across all musical genres. He retained more than 500 of his radio own programmes and kept many of his original interview tapes, including Andrés Segovia and Johnny Dankworth. The rest of his vast archive consisted of chord books, music sheets, concert programmes, record company promotional material, folk and jazz magazines, programme notes and scripts, many press cuttings. Even some of Django Reinhardt’s guitar strings! 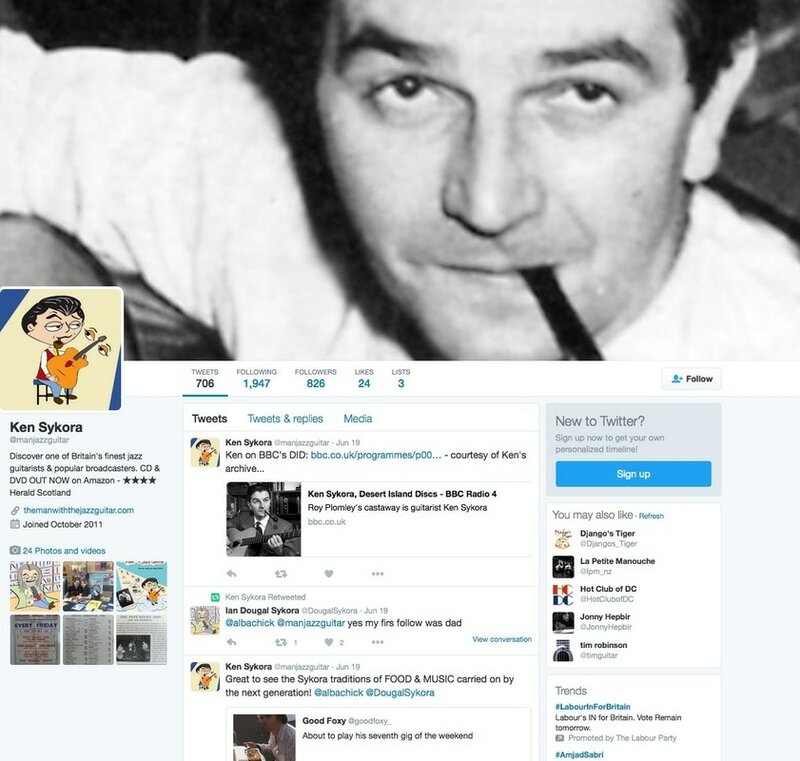 A small sample of Ken's archive has been digitised and made available online. A newsletter was published weekly for a year. Each one was based around a specific theme sharing anecdotes on Ken's life and findings from his archive. The 52 newsletters are available for download. 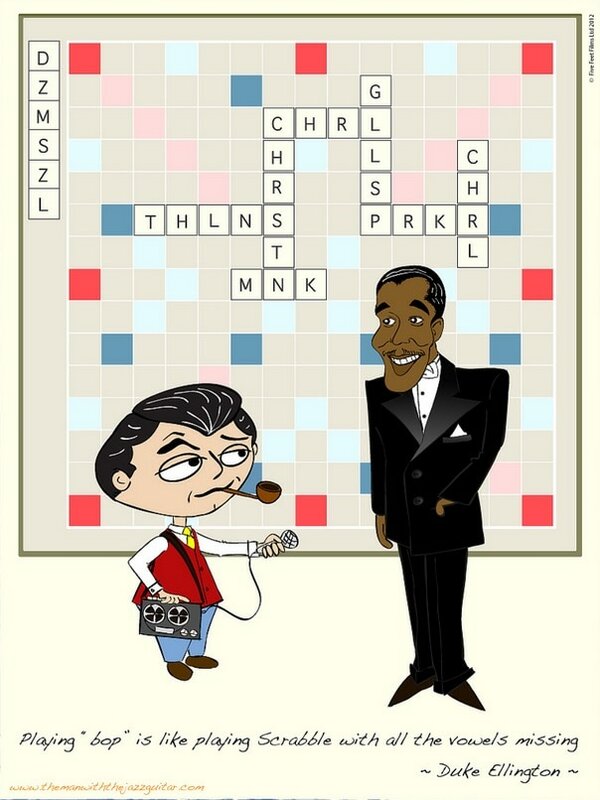 A series of humorous cartoons was created based on the themes of jazz, guitar and Ken’s sense of humour. They are available to download on Flickr. A digital series around food was conceived. Chef (and daughter) Alison Sykora recreated one of her Dad’s favorite recipes: "Borscht and savoury cheesecakes", with recipe to download. A competition was organized to name an untitled composition performed by Ken that was found on a recording sent to the producers. The winning title was “Ken’s Bounce” and the track was included on the CD. 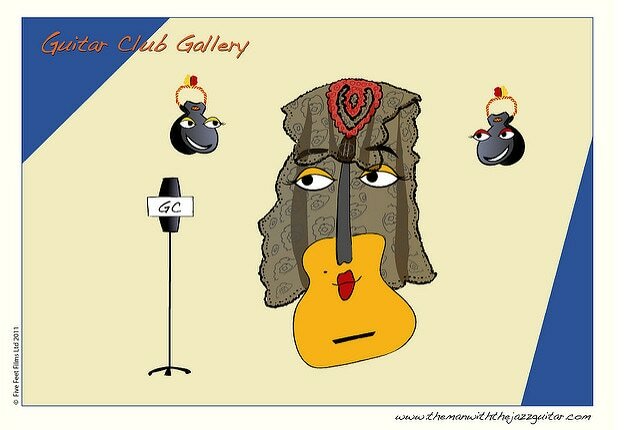 The Guitar Club Gallery, humorous illustrations of different guitar styles created as a tribute to Ken’s radio programme, was released as a set of postcards. An e-book biography on Ken and an interactive recipe book of his favourite recipes, "Ken's Kitchen", are in development. Ken is on Social Media, in Augmented Reality and the Ken Sykora App is available to download! We are delighted to find that, today, people from all over the world are coming across The Man with the Jazz Guitar and listening to a radio programme from 60 years ago, streaming Ken's music, buying a postcard, watching the film, or just reading one of Ken’s unique, off-beat anecdotes. His favorite song was Django Reinhardt’s Nuages, so it is fitting that Ken and his work are now in the cloud, forever.